Linnie’s Oxheart – Tomato Town organically grows heirloom tomatoes in the greater Kansas City area as well as Johnson County, Leawood, Lenexa, Olathe, Shawnee, Merriam KS, Independence MO and Kansas City Missouri, KCMO. Varieties include: Cherokee Purple, Brandywine, Stupice, Carbon, Black Krim, Black Cherry, Yellow Pear, Absinthe and Aunt Ruby’s German Green. This monster tomato weighed in at 1.8 ounces Saturday at the annual tomato tasting. 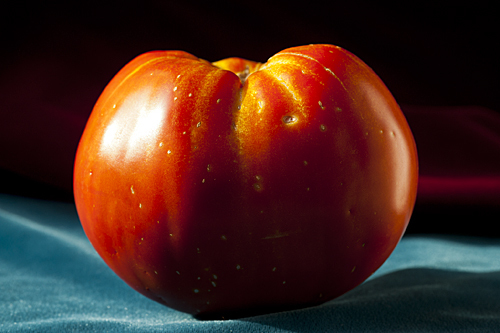 It beat out out a comparably-sized Black Krim by a single ounce. Oxhearts, as a variety, are typically meaty and tomato flesh edged out the juice on the scales. Landon Quigley, the owner of this fine specimen says he has also had good luck this year with Cherokee Purple and Gary O’Sena. We have not yet harvested a Linnie’s Oxheart, however, after seeing Landon’s, we greatly anticipate harvesting our own. This entry was posted on Sunday, August 7th, 2011 at 11:16 am. It is filed under Event, Varieties. You can follow any responses to this entry through the RSS 2.0 feed.